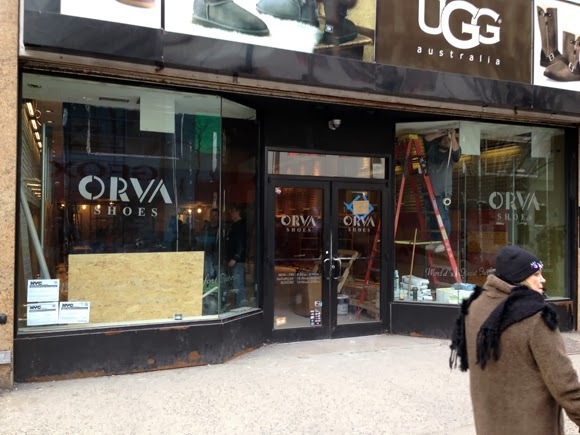 Remember how Orva Shoes is moving out of 34 West 34th Street to 1282 Broadway? Well, it looks like this is going to be a fast turnover as work on the building is moving right along for the new shoe purveyor, Journeys. Journeys was previously in Herald Center but moved out last year. We are happy to have Journeys back on 34th Street with their Dr. Martens, their UGG Australias, addidas, Toms, and other fabulous, fun kicks. Frankly, they didn't have a huge street-front presence at Herald Center, so it will be interesting to see what they do with a larger-profile space. Welcome back to 34th Street, Journeys!